Concrete floors are considered durable surfaces. Its installation, compared to other floors, is very cost effective. They are successful for their great resistance, reason why the industry almost exclusively uses this building material. 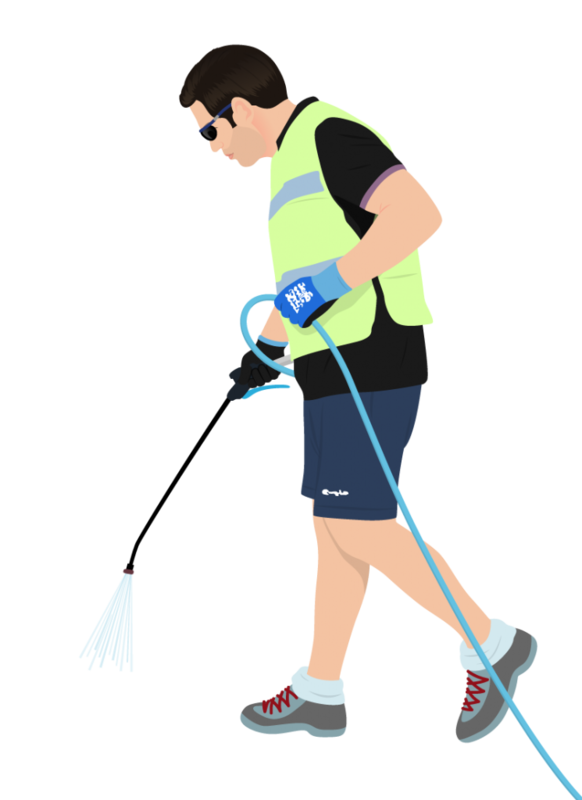 However, daily cleaning and maintenance of these surfaces may not always achieve the desired effect. Concrete dust is continuously present in the environment. This has a simple explanation. Troweled concrete floors have a micro-roughness. This means that the surface is porous. Therefore, the lime particles present in the core of the concrete - also known as concrete dust - can easily emerge from the interior of the substrate to the surface. Due to the porosity of the surface, dirt has easy adhesion to it and consequently causes deep stain adherence. 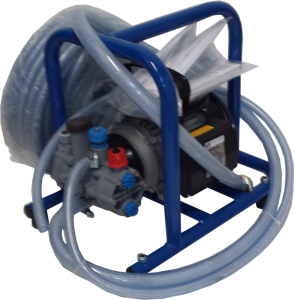 The DUALTREAT® dust proofing system eliminates the micro-roughness and improves the internal structure of a concrete floor. The treatment chemically bonds the lime particles and compacts the core of the concrete. As a result, the floor is strengthened and the abrasion resistance increases dramatically. 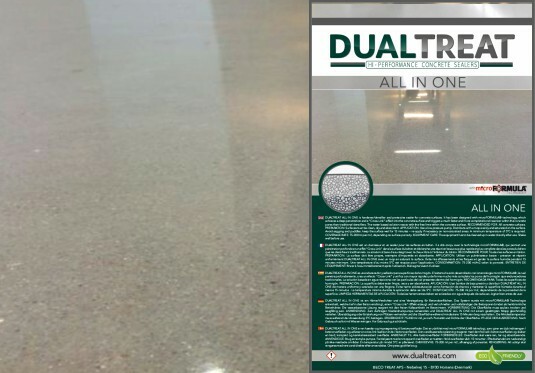 DUALTREAT® converts any existing concrete flooring into a smooth and easy-to-clean surface. Enjoy a dust-free environment with impressive aesthetics, creating improved traffic capacities with a long life span. DUALTREAT® AllinOne combines dust proofing and sealing in a single solution. We recommend this option if there is very little time available to perform the treatment. Ongoing production processes will not be interrupted and the concrete floor can be used immediately after treatment. With this option the dust proofing and sealing process are performed in individual steps. The first step creates a hard and dust-proof surface. 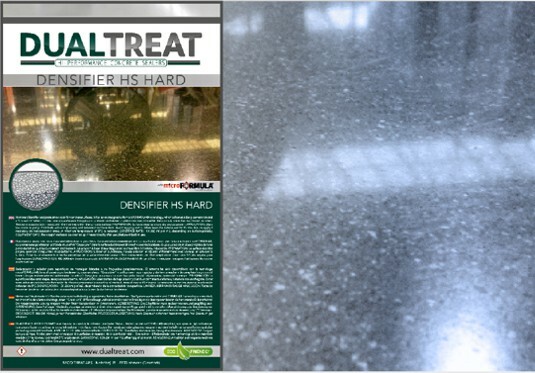 On floors with an already good hardness we recommend to use DUALTREAT® Densifier. 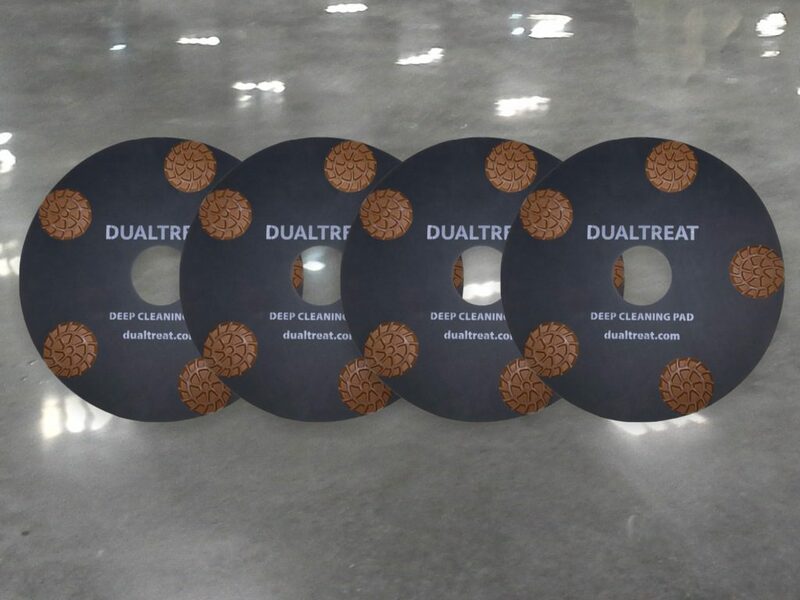 On soft concrete floors we recommend DUALTREAT® HS Hard. 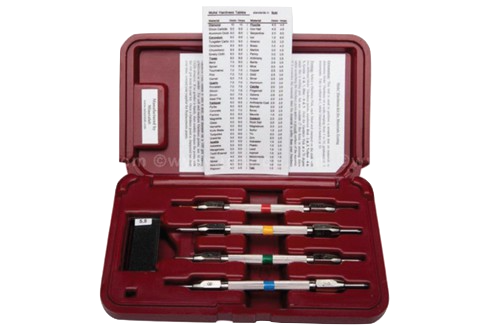 The existing hardness can be checked with our hardness tester. 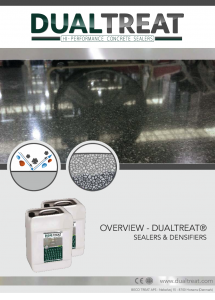 Once densified, the floor is sealed with DUALTREAT® Protective Sealer. This creates good chemical resistance and reduces the absorption of water, oil, grease, etc. Dust proofing and sealing with DUALTREAT® is a profitable investment. It reduces salt efflorescence and guarantees a dust-free surfaces for more than 10 years. Dust proofing brochures for our partners. 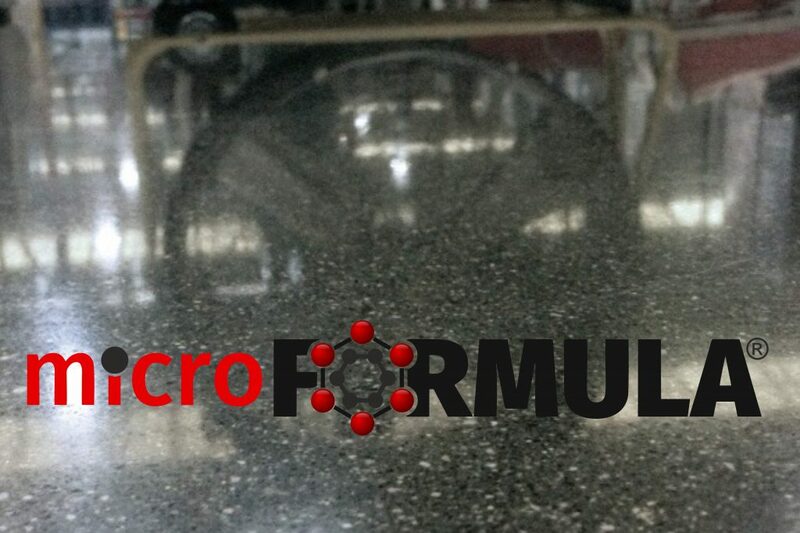 Our last generation concrete densifiers and sealers have been designed with microFORMULA® technology. It creates a "Cross-Link" effect and allows a much faster and deeper penetration than conventional systems. 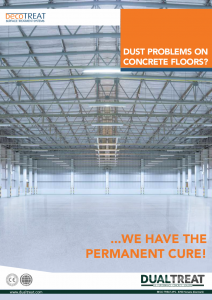 Your polished concrete floor will be dust proof for many years. Additionally, it will increase the abrasion resistance by more than 400%. 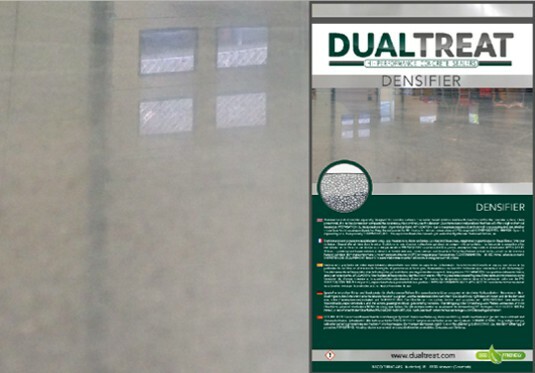 DUALTREAT® Densifier is a hardener and dust proofer especially designed for concrete surfaces. The water based solution reacts with free lime within the concrete surface. 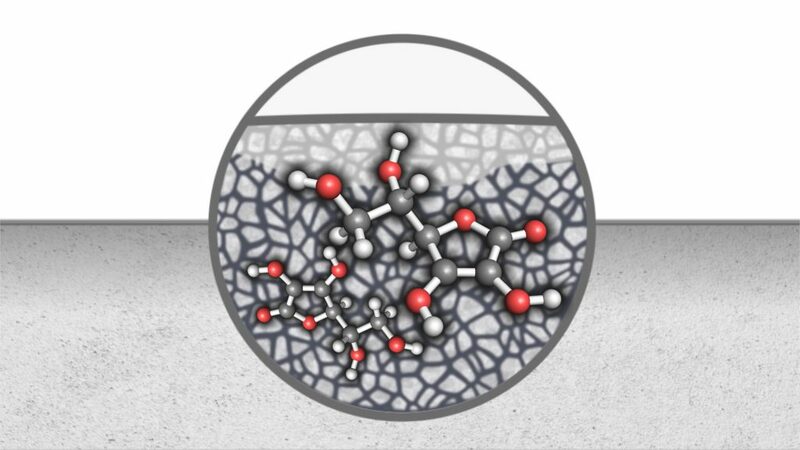 Once penetrated, the molecular reaction compacts the concrete surface and reduces the abrasion. 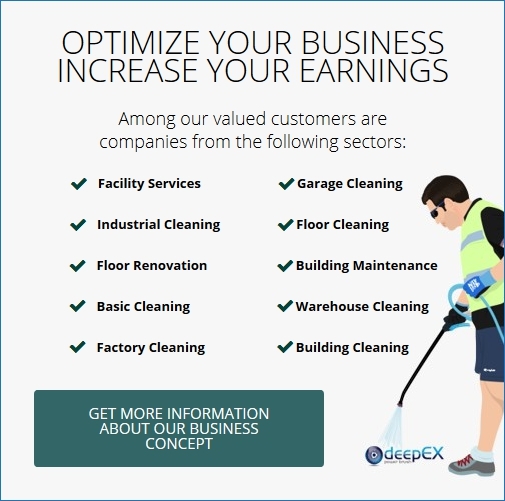 Dust formation is reduced and the floor will offer a higher chemical resistance. 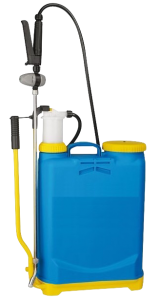 USED FOR: Concrete floors to create a dense and dust proof surface. • Ideally for WAREHOUSES, FACTORIES, CAR PARKS, etc. COVERAGE RATE: 100-150 ml/m² depending on surface porosity. DUALTREAT® Densifier HS Hard is a hardener and dust proofer especially designed with microFORMULA® technology, which achieves a deep penetration and “Cross-Link”-effect into the concrete surface and triggers a much faster and more complete bond reaction within the concrete pores than traditional densifiers. The water based solution reacts with the free lime within the concrete surface. USED FOR: Troweled, untreated and soft concrete floors. For grinding and polishing processes, where an extreme hardness is required. COVERAGE RATE: 100-200 ml/m² depending on surface porosity. DUALTREAT® AllinOne is a hardener/densifier and protective sealer for concrete surfaces. It has been designed with microFORMULA® technology, which achieves a deep penetration and “Cross-Link”-effect into the concrete surface and triggers a much faster and more complete bond reaction within the concrete pores than traditional densifiers. The water based solution reacts with the free lime within the concrete surface. USED FOR: Concrete floors like steel troweled, power troweled, burnished concrete finishes or polished concrete surfaces. COVERAGE RATE: 75-200 ml/m² depending on surface porosity. 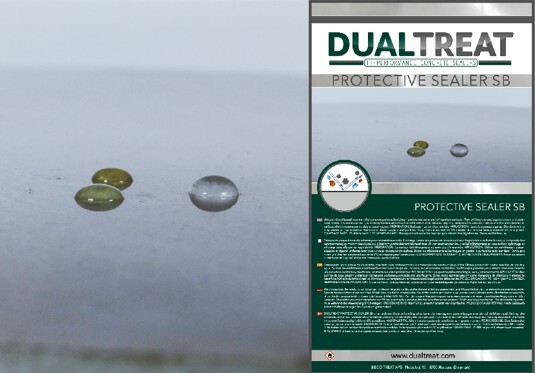 DUALTREAT® Protective Sealer is a unique treatment that reduces the absorption of water, oil and grease. It is a one coat nanotechnology formula with ultra-thin molecules that penetrates deep into mineral substrates and creates a hydrophobic surface, while it remains permeable to water vapor. USED FOR: All mineral surfaces like concrete, slate, terracotta, etc. 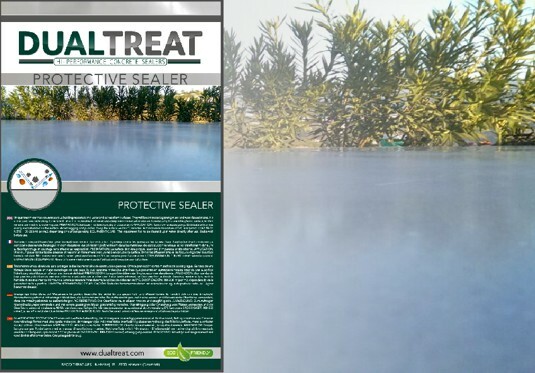 DUALTREAT® Protective Sealer SB is a unique solvent based treatment that reduces the absorption of water, oil and grease. It is a one coat nanotechnology formula with ultra-thin molecules that penetrates deep into mineral substrates and creates a hydrophobic surface, while it remains permeable to water vapor. USED FOR: Polished, dense and non-porous mineral surfaces like marble, granite, etc. COVERAGE RATE: 50-100 ml/m² depending on surface porosity. DUALTREAT® Refresh is a high-quality maintenance solution for concrete surfaces. It has been especially designed for areas with high people and machinery traffic. 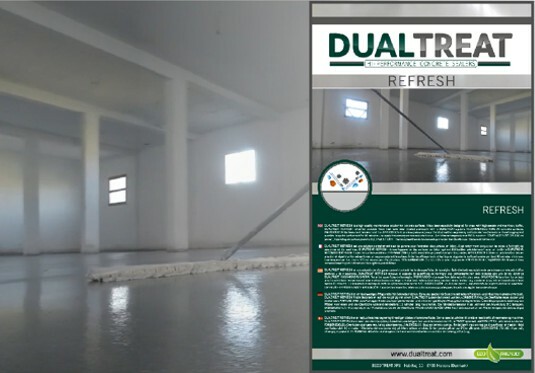 DUALTREAT REFRESH refreshes concrete floors that have been treated previously with a DUALTREAT® system. 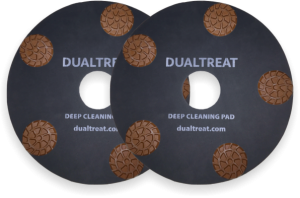 USED FOR: Surfaces previously treated with DUALTREAT®. COVERAGE RATE: 75-100 ml/m² depending on surface porosity.